This Moroccan Chicken Couscous Buddha Bowl is the perfect lunch. 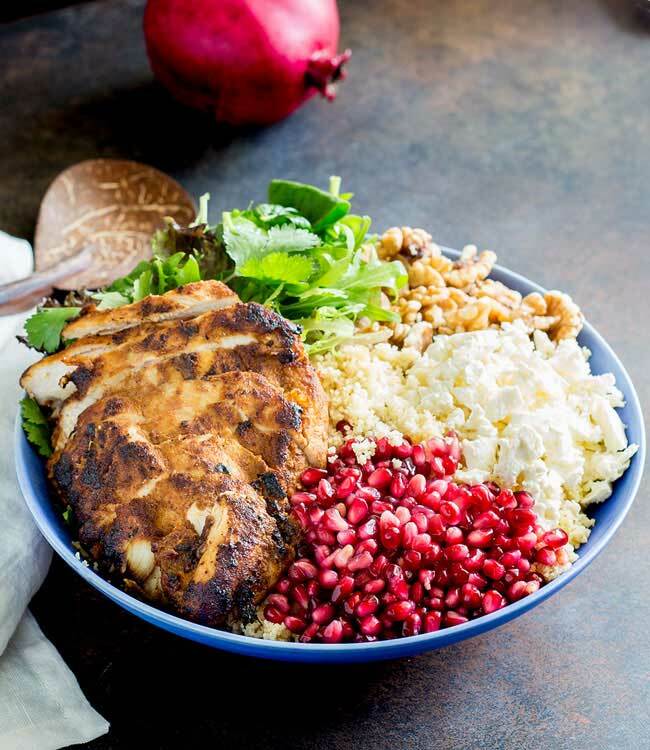 The chicken is marinated in wonderful moroccan seasoning, whist the sweet tart pomegranate and salty feta round out the dish. Served onto of a bed of couscous with plenty of fresh salad and herbs, this moroccan buddha bowl is sure to leave you feeling satisfied. The colours in this Moroccan Chicken Couscous Buddha Bowl stunning!!!! I love it. When I plated it up and looked through the camera I did a little dance. The colours just popped and made me smile. I think my gorgeous new blue bowl helped! Tell me it helped!!! As I am super in love with it!!! It is from the same company that supplies Masterchef with all their stunning bowls. I could have spent a small fortune on their stunning bowls! My other current favourite from them can be seen here in my Mexican Black Rice and Pumpkin Salad Post. Aren’t they both just gorgeous?!?!?! Don’t be put off by the length of the ingredient list. It seems daunting but most of it are the wonderful moroccan spices that are used to coat the chicken. They add an amazing flavour to the chicken! Slightly sweet, highly aromatic and with a wonderful warmth. This moroccan chicken is delicious! When you cook the chicken do it over a medium high heat, this will give you some fabulous colour and boost the flavours. But don’t use a super big heat or the spices will burn and turn bitter. YUCK! I have used feta cheese, but you can add some goats cheese or if you prefer a milder cheese some dry ricotta would be great. If you love dinner in a bowl, why not try this delicious quick Turkey Sloppy Joe bowl from Madison over at A Joyfully Mad Kitchen. 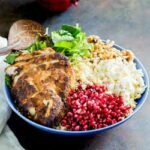 If you love this recipe for Moroccan Chicken Couscous Buddha Bowl why not pin it for later. 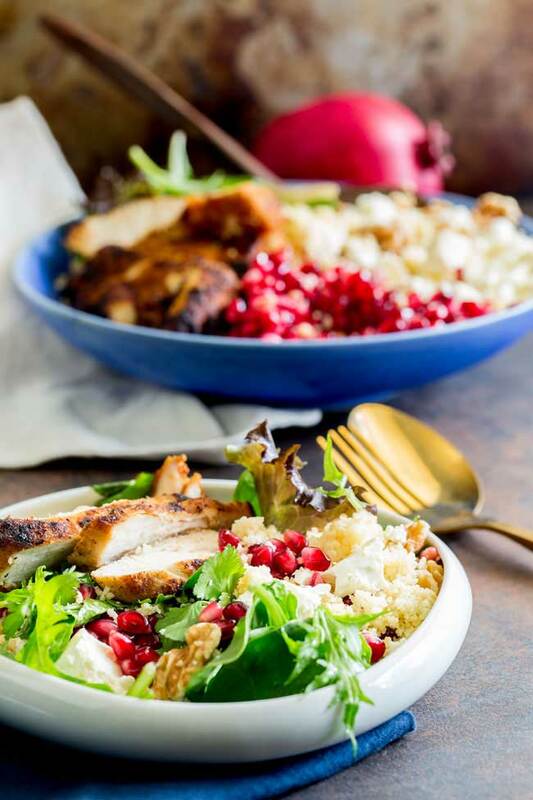 This Moroccan Chicken Couscous Buddha Bowl is there perfect lunch. 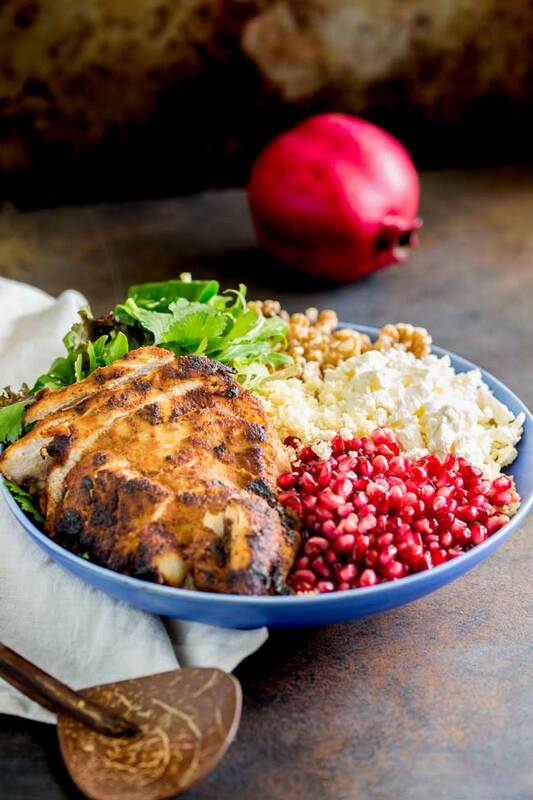 The chicken is marinated in wonderful moroccan seasoning, whist the sweet tart pomegranate and salty feta round out the dish. Served onto of a bed of couscous with plenty of fresh salad and herbs, this moroccan buddha bowl is sure to leave you feeling satisfied. 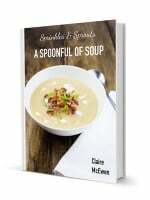 Recipe from Sprinkles and Sprouts | Delicious food for easy entertaining. Start by marinating the chicken. Place the chicken breasts into a large zip lock bag and then take a smooth meat mallet or heavy wooden spoon to lightly bash the breast until it is an even thickness. You are aiming for 1/2 inch thickness all over. Add the salt, sugar, paprika, ground cumin, ground coriander, ground ginger, cinnamon and cayenne pepper (if using) into the ziplock bag. Shake the bag to evenly coat the chicken. Then add in the olive oil and crushed garlic cloves. Squish the chicken and spice mixture together in the bag so the chicken is well coated. Then crush in the garlic and give it another good squish. Leave the chicken to marinate for at least 30 minutes. Bring the chicken stock to the boil and then add in the paprika, ground coriander and olive oil. Remove from the heat and then tip in the couscous. Place the lid on and leave off the heat for 10 minutes. Once the couscous has been sat for 5 minutes, take a fork and drag the tines over the couscous to loosen the grains. Add the fluffed couscous to the serving bowl. Get a heavy based fry pan super hot and add a splash of oil. Cook the chicken over a medium high heat for 5-6 minutes on each side or until cooked through. 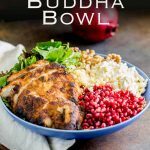 Slice the chicken across the grain and add it to your buddha bowl. Drizzle with the evoo and serve. 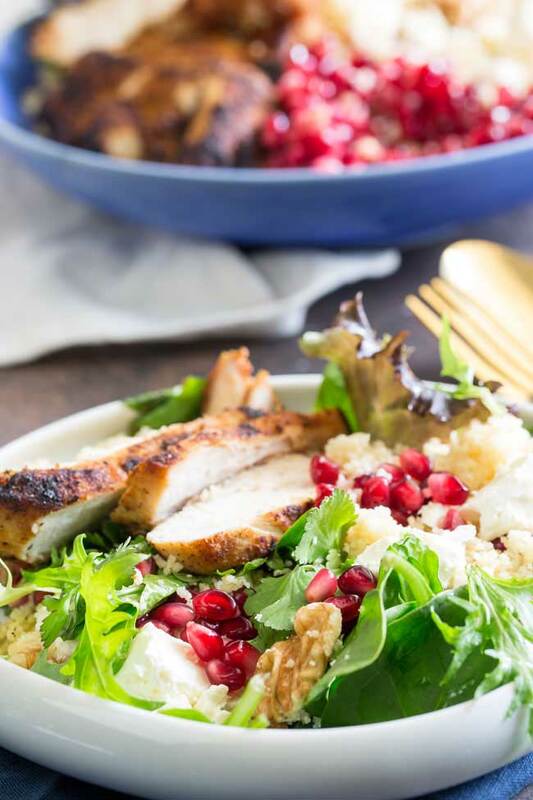 If you love food why not subscribe to my newsletter, I will drop you an email every now and then, just to say hi and send you a couple of recipes think you might love, like this Moroccan Chicken Couscous Buddha Bowl. This is a perfect healthy and delicious recipe) Sounds like it has lots of good flavors! Great recipe! I’m always looking for new bowl ideas for lunch. This one looks delicious and needs to go on my list for lunch this week!